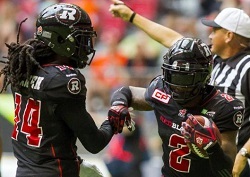 The Canadian Football League (CFL) announced its 2015 East and West Division All-Star selections, which includes three defensive backs from the East-leading Ottawa REDBLACKS and two DBs from the West-leading Edmonton Eskimos. The All-Star from the East include cornerbacks Abdul Kanneh (Ottawa) and Jovon Johnson (Ottawa), safety Craig Butler (Hamilton Tiger-Cats) and defensive backs Jerell Gavins (Ottawa) and Emanuel Davis (Hamilton). The West lineup includes cornerbacks John Ojo (Edmonton) and Johnny Adams (Winnipeg Blue Bombers), safety Josh Bell (Calgary Stampeders) and defensive backs Ryan Phillips (B.C. Lions) and Aaron Grymes (Edmonton). Coaches and media members selected the All-Stars. Adams is the only All-Star DB whose team did not make the postseason, which gets underway this Sunday. Adams, Phillips and Kanneh tied for the CFL lead in interceptions in the regular season, with each one collecting six INTs. Johnson, Davis and Ojo each had five interceptions. Davis had a league-high three INT returns for touchdowns, while Phillips, Adams, Ojo, Gavins and Grymes each had one pick-six. Three of the CFL All-Star DBs have previous NFL experience: Adams (Bills), Johnson (Steelers) and Bell (Broncos, Packers).